Atypique. That’s the word most often used to describe Bradley Wiggins by the French media, meaning atypical, unusual and special. It’s a reference to his character, whether his London sarcasm, the fluent French or his taste for things far beyond the bubble of pro cycling. But his whole career has been unusual, making him perhaps the most unique winner of the Tour de France. Here’s a look at his cycling career via 21 photos and a video clip. We start with Gary Wiggins. An Australian track rider from Victoria, he made his way to Europe in the late 1970s to make a living on the boards but bounced around from team to team and contract to contract. He met Linda in London and Bradley was born in Belgium. Wiggins didn’t know his father well and he died in mysterious circumstances in 2008. Asked the other day what Gary would make of the Tour de France success, Bradley replied “it depends if he was sober or not“. But if they didn’t get on, father and son have some similarities. Bradley’s first experiences in cycling were with a London club called the Archer RC which was the same club that his father rode for too in the 1970s, almost 20 years before him. Today the club has an online photo gallery with the earliest images of Wiggins in a race. Wiggins inherited the right DNA from both parents, he was winning early and getting special permission to ride in adult races because he was too good for his junior peers. It wasn’t long until his name appeared on the international radar thanks a win in the pursuit at the junior world track championships and he was brought into the British track team. But things were not organised like they are today, the state-funded program did not exist. Fellow track rider Chris Hoy tells tales of having to share a skinsuit and return it to the national federation after a world championships. As a result Wiggins ended up riding six day track races over the winter for income. Was he copying his father? Well he wasn’t alone, more British riders were making a living on the track than on the road with names like Doyle, Sturgess and Hayles. But along came Britain’s national lottery and with it, a commitment to fund sports. British cycling had seen Chris Boardman and his nemesis Graeme Obree duel on the track but things got organised. Funding was allocated to national federations according to performances on the world stage, gold medals in the Olympics translated into golden funding. National performance director Peter Keen made the obvious discovery that the velodrome was a gold mine with all sorts of medals up for grabs, compared to just four on the road for the mens and women’s road race and time trial. Better still, if many in Europe were dominating the road, the track was a relative backwater. Australia had made great gains with generous funding and Britain copied this, even poaching staff. The image above shows Wiggins at the first crossroads of his career in 2002, it’s one of those photos that says so much. The top tube of his bike says “UK sport lottery funded” but his shorts say FDJ, the French national lottery because he’d just signed for the French team after his previous team Linda McCartney had imploded in financial scandal. But if Wiggins was a pro on the road in contractual terms, he wasn’t quite living the life. FDJ’s manager Madiot later described Wiggins as “my very own Cancellara” but instead of being an expert in racing against the watch, he was better at wasting time. He took a flat in Nantes by a Chinese restaurant and if the town is prosperous, it’s a boring place and far from Parisian chic, Alpine scenery or Mediterranean warmth. He’d often end the day with a six-pack of beer or slope off the Irish pub, admitting to being drunk “half the time”. But he exaggerates and if he didn’t show the FDJ jersey, he was the opposite of a waster. The track was Wiggins’ focus and he collected several world champion titles but also impressed in time trials on the road and moved to Crédit Agricole for 2004. Again Wiggins frustrated his French management with his focus on the track but they knew the deal too and he landed gold in the pursuit race in the Athens Olympics. 2004 was a quiet year on the road but a giant one on the track, not just for Wiggins but for British cycling as they began to harvest the fruits of their medal targeting. But for all the gold medals, Wiggins was still on a modest income and struggled, spending a lot of time in a pub, downing beer after beer and gave “hydration” a different spin when he rode the Tour of Britain partly fuelled by beer. His French teammates called him le hooligan. Bradley Wiggins isn’t just a time triallist. He proved it winning Thursday’s 8th stage of the Tour de l’Avenir on a route with seven climbs. However the reigning world and Olympic pursuit champion doesn’t have the look of a climber. He’s proved that it’s not just against the clock where he can win. For 2006 Wiggins moved to Cofidis and started to have a big season on the road. No results but he rode the classics like Milan-Sanremo and Paris-Roubaix. It was also Wiggins’ first Tour de France appearance. The results were unremarkable but he finished and as the image above shows he was going in the breakaways like any dutiful Cofidis rider. Things went up a notch for 2007, he stopped becoming breakaway fodder. With Cofidis he took the lead in the Four Days of Dunkirk and then again in the Dauphiné. Note the picture of him above in the Dauphiné, first for his team mate Chavanel but also note his arms, substantially bulkier than today. Wiggins improved further in the Tour de France. It started in London and he was roared on to fourth place in the prologue. A long solo break followed during one of the flat stages across France where it was said some teams were happy to let him fry because he was outspoken on doping, the rent-a-quote Mr Clean. Then came the Albi time trial where he finished fifth only to find Vinokourov later disqualified for doping, so he rose to fourth. Suddenly we had a contender, he’d done two weeks of racing and could come close to the win in a time trial stage, all whilst some around him – not all – were doped to the gills. On the way home after that, I put my Cofidis kit in a dustbin at Pau airport because I didn’t want to be seen in it, and swore I would never race in it again, because I was so sick at what had happened. Actually Wiggins did race again in the Cofidis kit, taking two time trial victories before season ended. But he signed for 2008 with the American Highroad squad. Gone were the French squads and their old ways, with sirop in the waterbottles and dreams in their minds. Now Wiggins was spotted racing with a powermeter and teamed up with a young Mark Cavendish too. Wiggins and Cavendish had an odd year. It was an Olympic year again and Wiggins road season ended after the Giro but he rode through and finished fourth in the final time trial. This backed up his Tour ride in Albi the previous year, a sign of being a lot more than a prologue sniper. But 2008 was defined by success on the track, he took two gold medals in the Beijing Olympics and three in the world championships. The photo above lets us observe his bulky upper body, in particular the muscles on his back. He’d done a lot of work on his core to ensure stability when pushing a big gear on the track. In 2009 Wiggins joined the Slipstream team and started the year with a yellow jersey in Qatar after the team time trial. It marked the start of a giant season on the road. He was second in the Paris-Nice prologue, rode the spring classics – now famous for the skeletal photo after Paris-Roubaix – then did the Giro d’Italia. Here he found himself climbing well, not front group but visibly at ease in the mountains before finishing second in the final time trial. 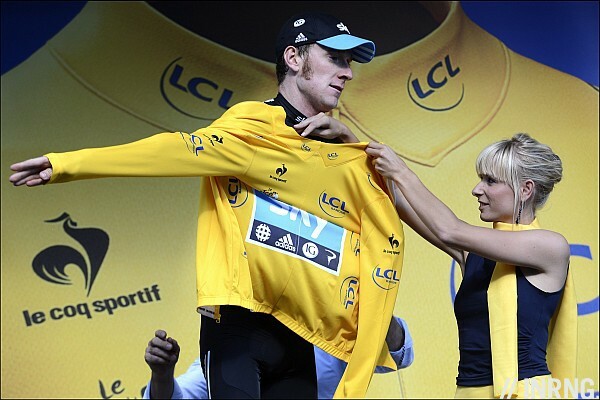 Wiggins was third in the Tour de France’s opening prologue, taking the green jersey. Note the image above taken before start of the stage out of Monaco, you can spot how lean his arms are. With hindsight perhaps the arms were a clue to his legs because on the first summit finish to the swanky Swiss ski resort of Verbier, Wiggins was there to watch Alberto Contador ride away and the Briton was hanging with the likes of the Schlecks, Vincenzo Nibali and Carlos Sastre, whilst Lance Armstrong was behind. In fact he even attacked the group at one point. This wasn’t a fluke. You can’t fluke this kind of power and as the image above shows, Wiggins was now amongst the front group in the mountains, a head of state, un client in French. He finished the Tour in fourth place, the revelation of the race. His season carried on, he rode the Eneco Tour and only stopped after the Herald Sun Tour in October, ending a block of 10 months’ racing. 2010 saw Team Sky launched with a fanfare but the team had been busy over the winter recruiting Wiggins and as earlier as January 2009 they’d presented their plan to Tour de France boss Christian Prudhomme. Sky bought Wiggins out his contract with Garmin, a very rare move in cycling and a sign of the new team’s financial firepower. The team arrived with the aim of replicating British success on the track on the road with talk of “marginal gains” and a fresh outside approach. Certainly the team was launched with a bang but the results didn’t match the hype. Wiggins was a prologue winner in the Giro but come the Tour, he fell apart and worse, the pressure got to him before he finally appeared in front of the media and gave an emotional confession before finishing 23rd overall. 2011 was a defining year. He made the podium in Paris-Nice and then won the Dauphiné. Suddenly he was a contender for the Tour de France, although I wrote at the time I couldn’t see him winning because the route was hard but took satisfaction from him winning the race and going for the Tour, that it was better to win races during the year on the way to the Tour de France rather than place all your eggs in the Tour basket. This insurance policy proved true when Wiggins crashed out on the road to Chateauroux. Could he have won? Now that we see him as a Tour de France winner it’s hard to know, I’d love to find out if his power data from last year was as good as this year. Wiggins hadn’t fully recovered from his broken collarbone when he started the Vuelta. It was going to be hot in Spain so he put his indoor bike in a toolshed along with a heater and simulated the Spanish climate whilst pedalling in the north-west of England. It worked and he finished third overall in the Spanish tour after leading during the race and helped by Chris Froome who finished second. There was no time for celebration. With an eye on the 2012 Olympics, Wiggins immediately aimed for the World Time Trial Championships after the Vuelta, riding a grand tour followed by a major time trial several days later was something to test and evaluate. Wiggins finished second in the time trial. He kept working over the winter and started 2012 with a bang. He won the Paris-Nice stage race thanks to his time trialling. After seeing this I changed my mind and wrote a piece saying that he could win the Tour as the route suited him but also he was growing in stature and increasingly at ease with leadership, either in the team or on the overall classification. This looked more certain when he won the Tour de Romandie with ease, even taking a stage in a bunch sprint. People were saying he’d peaked too soon but it never looked like this to me, he seemed to be following a plan. Things went up another level in the Dauphiné when we didn’t just see Wiggins win the race, his team controlled the race and the climb of the Joux Plane on the penultimate day was reminiscent of US Postal. Some made snarky comments – after all we now know US Postal had a team programme to dope many of its riders – but Sky’s doping was financial, they hired riders like Boasson Hagen, Porte and Rogers to play domestique when if they were on another team they’d be the sole leader. The came the Tour de France. Second place in the prologue in Liège was no surprise given his prologue past. Instead the knock-out result was on Stage 7 and the finish at the Planche des Belles Filles in the Vosges mountains. Chris Froome won the day but Wiggins was there with only Cadel Evans, Vincenzo Nibali and Rein Taraamae for company at the top of the climb. Wiggins took the yellow jersey on Saturday 7 July 2012 and that’s where the story ends, with Wiggins keeping the yellow jersey all through the race and he is now on the verge of winning the Tour de France. From Britain to France, from the track to the road, from invisible to hi-viz maillot jaune Bradley Wiggins has come a long way. Where will he go next? The phoenix has risen! Nice piece, again. Congrats Wiggins on today’s time-trial stage win thus confirming/solidifying Britains 1st TdF champion! Commitment, courage, heart and skill on display at the highest level and biggest bicycle race in the world! What about Froome? Will you write his profile? irrespective of what I’ve said about Wiggins for the last 3 weeks, he is a fantastic athlete who deserved to win this Tour. Tip of the hat for maillot jaune. I cannot say I am a fan, but the man proved me wrong, and with his team, they raced to their strengths. That the rival teams failed to deliver the expected challenges, and Sky managed this with 8 riders – (they lost Siutsov in the first week) is no mean feat……..
Congratulations – I can imagine the enthusiasm & pride that every British cyclist will enjoy. Nice piece as usual. He actually finished second in the Worlds TT last year, not third as you state. It’s almost like your suggesting Wiggo’s rise wasn’t just some nobody who’s become a Tour winner in the last 6 weeks. Wiggins came 2nd in the 2011 World champs time trial not third unless I have misread the article..
Great read, thanks. Also want to say thanks for all the excellent tour coverage. There are those who carp at the way Team Sky and Wiggins relentlessly ground out a result. But there’s no doubt that he’s a worthy champion, and a good role model for aspiring youngsters. If he and Sky encourage kids to get off their games consoles and on to their bikes, and if he and Sky rehabilitate in some small way a strong work ethic coupled with honesty in sport, with all that that implies in other domains, then we will be in their debt. Well done Wiggo, and here’s hoping that Cav puts la cerise sur le gateau by winning on the Champs Élysées. More than ever during this tour de France, I have appreciated your unbiased and impartial but still passionate and knowledgeable view on the entirety of the sport of pro-cycling. Your view on Wiggins has been consistently sane and non-judgemental but I will love you forever just for your article on Nutella. 🙂 Thanks for making yours the must-read blog for informative and reliable opinion. As much as some people have said that Wiggo’s brilliant TT performance today has put to rest all questions about whether or not Froome could have beaten them, I didn’t see this as unexpected given what has happened in the race. What nobody can ever say is that Sky picked the wrong leader–they won the race, and in the end won it with comfortable margins. Even if they had gone into the Tour with Froome and Wiggins as co-leaders and allowed the road to decide who would get support, Froome’s early minute and a half loss due to a flat would have decided that. When you win both time trials and control the mountains, a strategy with precedents in men like Indurain and Anquetil, you are a deserving winner. 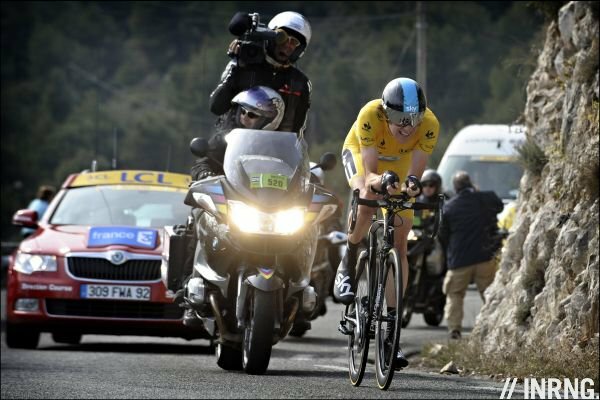 Now, could Froome have made up the TT losses in the mountains? Perhaps. I don’t recall ever seeing a Tour winner so inextricably linked to teammate in the mountains–Except for two short pulls at the front on separate stages, Wiggins was never without Froome eating the wind for him. And I guess that’s okay. I have to say that Wiggins appears to be an exceptional teammate; perhaps he’s moody, but for all the talk about a rivalry between him and Froome, they seem to get along fine and there’s be no actual tension on the road (cf 2009). And Wiggins has willingly led out both Edvald Boasson Hagen and Mark Cavendish while wearing the yellow jersey, a rare sight indeed. Impressive. Thanks. I gather we’ll see Wiggins in lead out mode tomorrow too. Great mini-biography! One small correction for you – he won two gold medals in Beijing not three (he has another gold from Athens). Quite right, it was three golds at the worlds instead. Fixed. My 7 year old and 3 year old were tearing around on the patio late this afternoon on their bikes. I want to be Bradley Wiggins says my 7 year old. I’m Mark Cavendish, says my little ‘un. Someone said on the UK news this afternoon that it was like 1966 for cyclists….they’re not wrong. Between the roadies and the trackies, it must now be fair to say that the UK is the strongest cycling nation in the world. ha 1966 – good reference. Not too many major sporting achievements for England / GB since then. Well done to Wiggins. His Tour win will be remembered for being weaker than his teammate. There were two stages, which I’ll remember most, stage 7 and stage 17, in both Froome was better. But what is very interesting that those who finished in front of him in 2009 were not racing this year. The TT stages are part of the race. Best climber is not the same as best rider. Contador would be only rider to launch sustained attack that would’ve caused real problems. Supposedly 500w would not have been enough to gain ground as its not sustainable. AC is the one rider who can muster a 700w attack, recover and attack again 500+w and thus make a difference. But alas he wasn’t there so the race was what the race was and hard to say AC would’ve put in enough time in the mountains to be secure in TTs and Wiggins would’ve gained time in TTs…again ASO screwed the pooch in the race route, it was boring and lame. From what I gather, next year will over-compensate you with mountains. My mouth waters already. I’m looking forward to that post whenever you’re able to put it up. I’m sure that 3 days in Corsica, and a ride around Nice will shake up GC at the start of the race, and hopefully produce a parcours without precedent. Then we’ll see how the teams deal with that. Lastly, lets hope the Tourmalet is put to bed for some time – bring on Ventoux! Hmm. The only rider to to muster 700W attacks – is that chemicaly asisted or unasisted? Yea, Let’s consider Contador. He’d prob be good for even more power… if (unbeknown to him) somebody slipped him some powder. Get real. @ave, weaker then his team mate, on stage 7 and 17 Froome could have taken 30-45 secs max. Overall gap is more then 3 mins. You can do the maths right? You win a race over 21 days, not just in the 2 mountain stages that you’ve just mentioned. 30-45 secs max, is that a fact? You’d never know. He could have chipped time away in other stages too. People are still banging on about why Froome wasn’t leader. It seems simple to me – Froome has basically one good result – 2nd at the Vuelta last year that he arguably could have won. Wiggins on the other hand is a multiple world and Olympic champion who has completed multiple grand tours and finished in the top 4 twice. Who’s the safer bet? Froome may well be the future, but the future hasn’t happened yet and in the meantime Wiggins was the best rider for this years course. I’m really looking forward to next years race already. I’m expecting some big mountains for the 100th edition and Contador back with a point to prove. If that’s the case, Froome with Sky and Wiggins behind him will give him one hell of a battle which could make a fantastic race (I’m discounting Andy Schleck – he’s such a poor TTer and so tactically naive that I just don’t think he’s got a GT win in him, plenty of podiums but he’s just not a winner). Wiggins isn’t playing second fiddle next year no matter the route. No Tour winner comes back year later to be super domestique. Wake up. Agree – Wiggins is the boss and it would be hard to play super domestique. I think it was agreed between Evans and van Garderen that he, TeJay, should go for broke in the 2nd TT no matter the consequences. There would be very complex emotions at play with being overtaken by your very young teamate and being the defending champion who was nowhere near his best. They seem to have a different relationship to Wiggins and Froome. On reflection, the psychological warfare was more interesting than the actual race. Hinault in ’86. That was his job, even though he strained against it. I think it is not unlikely to happen with a calculated Sky though. If the numbers show Froome he is the better rider then I imagine that will be the case. It’s amazing what only superior training and preparation can get you in cycling, just look at what Lance did only by scouting out the route and training better. Impressive feat of sports science and Wiggins dedication thereto, but for the sports sake I hope this isn’t the “new way” of racing. Having a little existential crisis as a cycling fan I guess — Wiggins says gone are the old attacking days and that this is the more “human” way of racing (http://www.cyclingnews.com/news/wiggins-the-tour-is-a-lot-more-human-now), but also describes Sky’s watts-based probability calculus as to the success/failure of attacks. I guess math is human, but this tour kinda felt like watching the green code screens in “the Matrix” movies — a computer running the numbers. Kudos to Sky and GB for finding a way to technically win, but for the sake of the “beauty” of the game of cycling I hope the race directors figure out how to promote a little more human intuition/heart/soul next time around. There are so many variables beyond a rider / teams control that I don’t think the purists have anything to worry about. What we have seen is a new wave of professionalism and I have no doubt that this will be studied over the next few months, adapted and incorporated, resulting in a different Tour again next year, with some of the inequalities ironed out. I think when a man plays such a massive part of the equation as with pedalling a bike there’s only so far marginal gains can take you, the rest is down to the talent and dedication of the individual. Wiggins is that man this year beyond any doubt. You have nailed it, dmd. My admiring congratulations to Wiggo (and Team Sky) for coming up with a plan how to win the Tour with him and masterfully executing this plan to perfection. And this includes buying the right teammates which could otherwise be competitors. But this way of racing is not attractive for the spectators unless you are a devoted fan of the rider / the team who execute it. I assume (or better hope) that Prudhomme and Co. learn from that and will want to avoid running into another era like those of Wiggo’s idol, Big Mig or the Texan. In order to make the race more attractive they will have to cut down the ITT mileage and make sure it’s decided in the mountains. The race will need some stages where the benefit from having a super strong team is as small as possible (it will still be big). And then of course the race will need competitors who are able to really challenge Sky. This is not intended to lessen the success of Team Sky and Wiggo in 2012 but the “ease” at which this success came and the (relative) boredom it provided for most of the spectators was also due to the inability of the competition to challenge Sky in the mountains. Wiggo and Froome have not only been the strongest in the ITTs they also were the strongest climbers. Let’s hope that this will change when Berto, Andy and maybe Cadel in his 2011 shape are back in the game. dmd, I totally agree. While Wiggins has completed an absolutely phenomenal achievement by (almost) winning the Tour by such a large margin, I wonder whether he could have done that with a less-dominant team? Sky clearly knows what they are doing, and their tactics are sound. But I agree it doesn’t make for the most exciting racing or Tour. I know this has been discussed a while ago, but whatever happened to the suggestion to ban race radios? Surely this would introduce the element of tactical uncertainty that the Tour organisers have been hoping for? a few years ago before race radios were introduced. Great article. As a new comer to the word of cycling and road cycling, it’s great to see someone win that put in the hard work, dedication, sacrifice, and time that it requires rather than doping their way to the top. Far and away the most interesting writing on cycling on the web….ever. Somebody prove me wrong. 1. 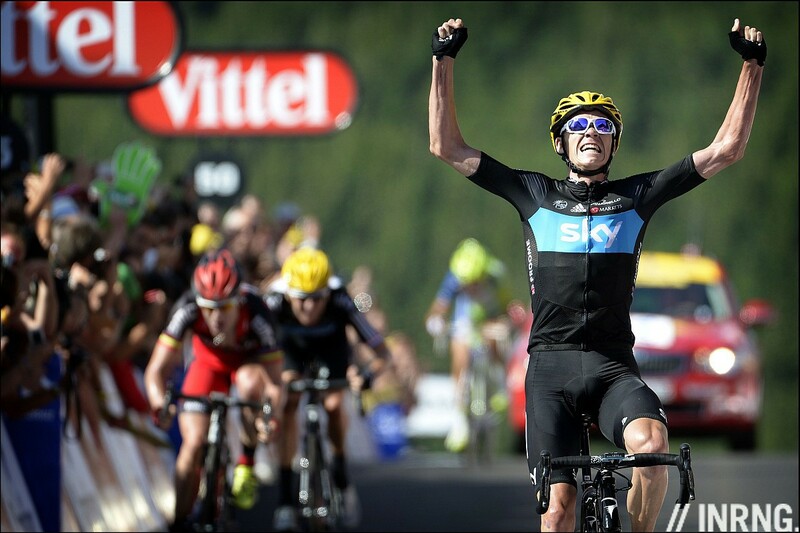 Froome could very well have won the Tour if he had not punctured on Stage 1 losing 1.30. This would leave him (all things being equal) with an ending deficit of 1.51 on Wiggins. That, he could have made up if he had his head in the mountains (I think the math is right). Of course he was a domestique – unfortunately for us it was the only animation we saw out of Sky all Tour (except for Cavandish – bye bye Sky in 2013). 2. Wiggins doing leadout is his compulsion to stamp his leadership on the team. Nothing else but fair enough to do it. 3. Let us hope that this is not how all future tours are – an amazing set of machines doing tempo without emotion. Wiggins said that the days of the courageous lone rider are over – I think he said something like that ended in the 1990’s. He then goes on to contradict himself saying that he was inspired by Evans’ courage in 2011. I assume he was referring to his single-handingly hauling back the deficit on Stage 17 in 2011 with no help. The same stage that Contador went backwards. If that wasn’t an historic solo effort then what is. Thank you for your site – it is refreshing to discuss cycling without the abuse and ignorance displayed elsewhere and where all opinions are respected. Agree with 2 and 3. Well stated. There’s no lack of emotion, listen to him talk after the stage. Emotion doesn’t just mean riding solo for 200km, he’s given body and soul to win this race, that is a profound emotional commitment. What he meant was that long-range (200km) solo attacks in the mountains aren’t possible now, by implication, if the riders are clean. Thank you so much for explaining that to me. Yes, Wiggins specifically said it’s great to watch lone attacks as a fan but 20 mins at 500w is not really possible. Landis for instance. Also don’t agree with point 2 about Brad leading out to stamp his authority on the team. I think he’s doing it because Sky has worked as a team and Brad is trying to give something back to the sprinters (EBH as well as Cav) that have worked so hard for him. cancellara looks like mike cooley. if you don’t know who mike cooley is, you betta axe somebody. Excellent article on Wiggins. Thanks. I learn so much from your blog. This looks great. Heading out to do some climbing and am saving this article to devour later. My admiration for Wiggins has only grown over the past week as he’s seemed to mature and go through a metamorphosis under the extreme heat and pressure of the tour. Thanks for the work you put in on this. I’d have to say Wiggo’s success was taken up a level when he was with Vaughters at Slipstream. I’d like to get on that diet. Enter the new “coat hanger era” of pro cyclists. Thin is in. One rectification. Wiggins wasn’t second in de 2009 TDF opening TT, he was third. Great article and a general thanks for your superb coverage and insight. A very good read and the selection of images. why don’t people touch on the fact that he is a Ginger? a fugly red headed cnut!